Though the movie provided Elvis with one of his few opportunities to serious drama, the film’s producers and Colonel Parker were nervous about the reaction of fans. To hedge their bets, they attempted to insert four songs into the film. Director Siegel was not pleased with that decision and fought to keep the songs out even after he had shot them. The final version of the film contains two songs. Siegel realized from his experiences with Flaming Star that Elvis’ chance of pursuing a serious acting career were doomed. He later told Rolling Stone magazine, “I found Elvis sensitive and very good, with the exception that he was very unsure of himself… He felt he could have done better things. 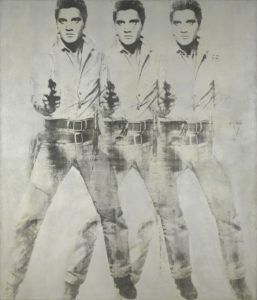 An Andy Warhol painting of Elvis Presley – the pop artist’s only full-length portrait – is for sale with an estimated price tag of around US$30 million (A$39 million). 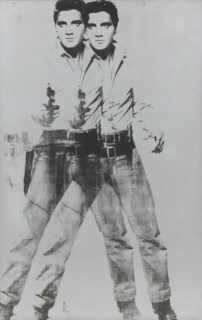 The “Double Elvis” screenprint depicts the hip-swivelling musician holding a revolver, as he appeared in the 1960 western movie Flaming Star. A ghostly duplicate image hovers in the background. The portraits are on display at Christie’s London showroom from Friday until Tuesday. 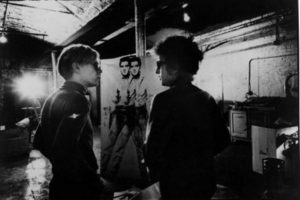 Christie’s contemporary art chairman Alex Rotter said the paintings – of “the King of Rock ‘n’ Roll and the career criminal” – are “very memorable and early examples of Warhol’s profound understanding of fame”. The record for a Warhol work is US$105 million (A$136 million) paid for ‘Silver Car Crash (Double Disaster)’ at a 2013 Sotheby’s auction.